2002 Sierra Nevada - Ambition Meets Its Match! Not surprisingly, it took us a few extra minutes to rouse ourselves in the morning. We ate cold food in haste and dashed downhill, past Merced Lake and its Sierra High Camp, and walked mesmerized past the beautiful lake. 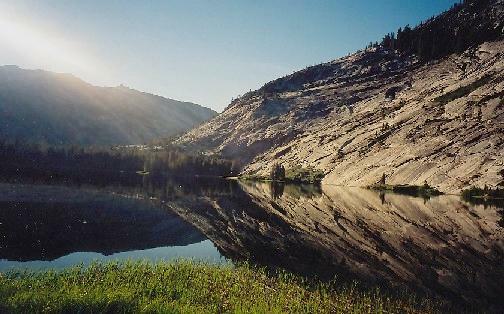 Perfectly reflected granite cliffs, with large trout lurking against the shoreline, made this a place worth seeing often! The stream was just as beautiful below the lake, and we soon met the junction at Echo Valley. 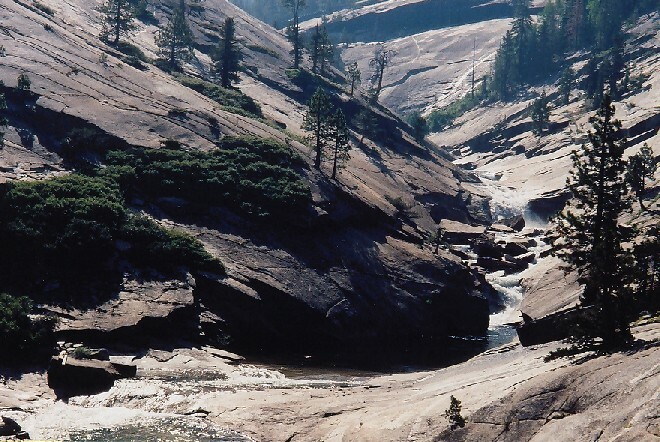 Since we no longer planned to capture either Clouds Rest or Half Dome, we turned left and followed the Merced past Bunnell Point and its sliding cascade, and finally to Little Yosemite and another chunk of the Muir Trail, which we would follow the rest of the way. The smoke was still pretty thick, but not getting much worse. We were now meeting more and more people, mostly with small rucksacks or even less; none seemed willing to trade me packs despite the clear economic advantage of my gear! Soon enough we were at the Mist Trail junction, passing a group of over a dozen teens and two harried adults. It seemed that well over half the teens were out of water, many for quite some time; the adult refused my offer of water from my bottle and began a lecture that I'm sure they had heard before. We moved on to the river just above the falls, where we took a break and observed the fire that was burning in the hanging valley between Nevada Falls and Half Dome. As it turned out, the Half Dome trail was closed due to the fire; had we tried to reach the summit we would have lost plenty of time and valuable energy! The final three miles now awaited our footsteps! We strode / staggered down the steep trail, encountering still more people whose accents betrayed a wide range of foreign visitors. Some of the conversations I had were quite interesting, most especially the one where the man offered to shoot me to ease my 'broken leg' (I was wearing a knee-brace, as I had pretty much the entire trip). I asked for a last beer before being shot, and he pretended to acquiesce before laughing and passing me by. As has happened so often in the past, Scott began to accelerate as the finish line drew near; I let him pass and wandered down with Larry, whose knee was troubling him on the descent. We reached a junction with no sign of Scott, or the Muir Trail: just a sign that cryptically read "foot traffic only". While that sounded promising it was decidedly unclear, and since I saw no sign on the other trail we chose to go that way. (Scott claims this trail was marked for stock; sure would have been nice to see that sign!) The trail was clearly leveling off, but of course the temperature was pretty warm down here, the lowest elevation we had visited since .. who knows, but it was long ago when we traveled by car! As we crossed a stream I asked Larry if he needed to stop for a bit. He pondered it a while before realizing that this proved he needed a break, so we broke for a while by the pretty stream. At last we hit pavement, and followed it into civilization! After Scott headed for Bishop, Larry and I verbally explored our options. Reno was a long way away, and the smaller towns could charge any price they wished. Despite our wish to head north, we accepted the math and turned south to Mammoth Lakes and a comfy room there. The next day we headed north by the usual route, reaching Medford just in time for a BBQ dinner! We stopped at a local store to grab some grub, found some cool Hawaiian shirts, and showed up in style! We made it home Saturday, leaving plenty of time for Portland's famous brewers festival the next day. What a trip! And that might not be all for 2002! Check this space for a possible autumn trip south!